I come here not to bury the Denver Nuggets, but to praise them. Sort of. 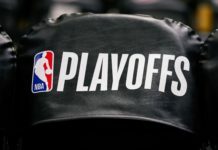 The Nuggets missed the postseason — again — despite a roster with enough talent to not only make it, but perhaps even reach the Western Conference’s three-seed; a goal that eluded them by a mere three games. Much of the blame for that will fall upon the shoulders of coach Michael Malone. At the same time, the Nuggets team that finished the season no longer resembled the one that started it. Malone, who isn’t a glamorous head man and certainly has room to improve his in-game decision-making, nonetheless bumped and bounced his way through a tumultuous season in which the Nuggets ended as a team with an identity — one of the most difficult things to create in the NBA. Malone matured along with his team, and his position as the Nuggets’ head coach should be secure. He was given a four-time All-Star and the third-highest paid player in the NBA, but Paul Millsap missed 44 games with injury and the entire team struggled at times trying to incorporate his lunch-bucket playing style. 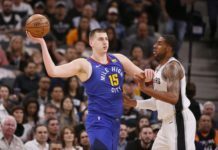 His best player, Nikola Jokic, is basically a basketball unicorn; a preternatural passer that finds angles that don’t even exist to the average player, and one whose eye-popping performance belies his pedestrian (by NBA standards) athleticism. The still-raw hoops savant is unselfish almost to a fault, and there’s no blueprint for that kind of player — Malone is in uncharted waters. His starting small forward — and the fourth-highest paid player on the team — has wanted out of town for years, and it shows in Wilson Chandler’s too-often disinterested style of play. He can finally get his wish this summer by exercising an opt-out clause in his contract. The third- and fifth-highest paid players on the team — Kenneth Faried and Darrell Arthur, respectively — never see the court. Faried’s relationship with the Nuggets appears to be broken beyond any possibility of repair, and Arthur is the odd man out on a squad with six power forwards. Two of the team’s most tantalizing prospects — Juan Hernangomez and Malik Beasley — reside in limbo; they’re not good enough to stay on the floor yet, but haven’t been able to play enough minutes to show the Nuggets what they can become, either. As the team’s second-highest paid player, Mason Plumlee isn’t even the sixth man — he’s the seventh. While Plumlee’s a heady and versatile player, the Nuggets didn’t need to pay him a salary that averaged roughly $14 million per season last summer; Plumlee was a restricted free agent, and didn’t receive any offer that the Nuggets had to match. They bid against themselves — and lost. Before the season began, the Nuggets watched Louisville shooting guard Donovan Mitchell somehow fall to them at No. 13. The Nuggets drafted Mitchell, and then traded him to the Utah Jazz for backup power forward Trey Lyles and a later pick that turned out to be Tyler Lydon. Instead of installing an explosive small-ball lineup that utilized Mitchell, Jamal Murray, and Gary Harris, the Nuggets watched Mitchell take the league by storm, earning Rookie of the Year consideration while averaging 20.5 points per game. That average would have led the Nuggets this season. Even with all of that, the Nuggets finished 10 games over .500 in a Northwest Division that sent four teams to the playoffs — fully half of the Western Conference’s field. Moreover, the Nuggets finished the season playing their best basketball after evolving into a squad driven by their three best players: Jokic, Murray and Gary Harris. With a pecking order finally established, the Nuggets began to play like a team to believe in. While Jokic, their best player by far, filled up the stat sheet every night, his passive nature doesn’t make him a good fit as the team’s leader. 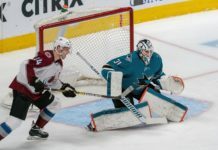 Enter Murray, a sharpshooting, cocksure firebrand whose personality began to shine through in March and April. Murray’s relentless approach fills that need for the Nuggets. Harris, the team’s best one-on-one defender, has a varied skillset that allows him to fill in whatever gaps the Nuggets may have on any given night. The trio finally meshed with Millsap near the end of the season to create a flexible and dangerous group of starters. It’s a start. The end result is that the Nuggets still ended up one game out of the playoffs — exactly where they were last season; there’s no avoiding that. Even though they appear to be on the right track, it’s clearly not enough, and a pivotal offseason approaches for the Nuggets’ front office, who need to deal Malone a better hand than they did in this campaign. 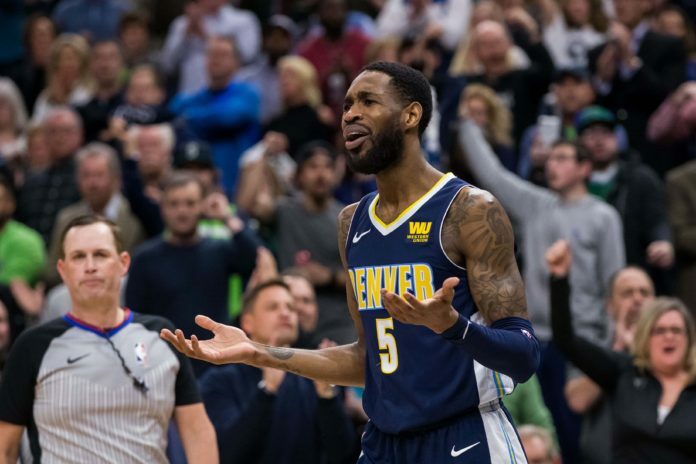 Chandler and unrestricted free agent Will Barton almost certainly won’t be back — and after missing the playoffs again, failing to trade them means they’ll walk away for nothing. The Nuggets made the same mistake last year with Danilo Gallinari, believing that the potential of claiming the eighth seed was more valuable than adding assets to climb even higher next season. At ages 37 and 35, respectively, it’s hard to envision the Nuggets retaining either Richard Jefferson or Devin Harris; both are unrestricted free agents. They’ll need to find a starting small forward — and trying to convert slender power forwards Lyles or Hernangomez won’t cut it against the West’s hyper-athletic wings. A veteran backup point guard would be helpful, but one would hope the age is closer to 25 than 35. Most importantly, Denver has to find a way to shed the salaries of Faried and Arthur; albatross deals that inhale the cash that will soon be needed to sign Jokic to a long-term contract. Jokic will be an unrestricted free agent at the end of next season, and make no mistake — if Jokic isn’t signed by then and hits the open market, he’s history. For the greatest talent the Nuggets have had since Carmelo Anthony, that’s unacceptable — they must get Jokic signed this summer, and they’ll have to free up the $21 million that Faried and Arthur are set to make to do it. Whether the Nuggets believe it or not, they are — and were — a team in transition. This offseason, they’ll have to act like one if they want to believe in themselves as contenders.